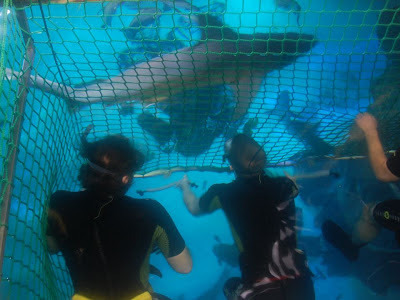 On Saturday, Francis and I had a day out in London...leaving home before 9am, we went to the London Aquarium (which is fantastic) where we went on a "behind the scenes" tour, and then Francis went snorkelling with the sharks which was part of his Christmas present. We found a restaurant for lunch, wandered along Southbank and then returned to the Aquarium, seeing everything but paying particularly attention to the adorable penguins they now have! We left with a renewed enthusiasm for going scuba diving again soon, and finally setting up our home aquarium. We got home at about 6pm - I'd spent all day on my feet but really enjoyed myself. That evening, about 8pm, we were slumped on the sofa watching TV - I was also on the laptop, looking at Facebook. I noticed a message posted by Foxy from Enigma Running asking if anyone wanted to run a marathon the next day as he had a spare place in the Enigma Winter Marathon in Milton Keynes. Now I realise that any normal person, having put on half a stone over Christmas and not having exercised as much as they should have done, and generally feeling tired after a day out, would have thought running a marathon on an evening's notice wasn't the most clever thing to do. However, I appear to have become a fully fledged marathon nutcase and as we didn't really have any plans for Sunday and my schedule said I had to run 15 miles anyway, I thought that an extra 11 wouldn't be too much of a stretch. There seemed to be a fair few people I knew already running the marathon, and so without really thinking about it, gleefully took the place. So, I pulled my stuff together, had a pint of water to try and make up for the lack of hydration during the day, and headed to bed early. 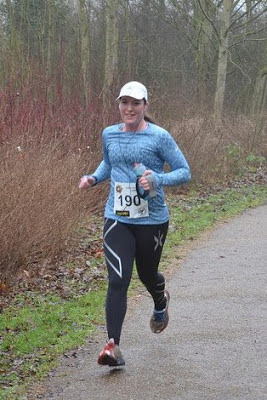 I've run the course before, at the Enigma 30 miler I did back in July, and I think it helped to know what to expect, but I found the 7.5 laps of Caldecotte Lake hard going psychologically, although physically I wasn't too bad at all. I just couldn't really get my head together and in the later laps, kept finding myself walking when I didn't need to. I also got incredibly hungry at about mile 14 and then later again - I was very lucky that there was food at the aid station otherwise I think I probably would have hit the wall, which is something that hasn't happened in years, but which was obviously just a result of the inevitable lack of preparation. My official time was 4:19:36, although my watch did clock 26.78 miles so it seems I travelled a bit further than I needed to which added just over 6 minutes to my final time but regardless of that, this was still my slowest marathon for over a year and a half!